Dad's advice seems to get better after his kids become parents. (RealSimple.com) -- My father spent his youth as a crossing guard, a Boy Scout, and a designated driver. I, on the other hand, squandered mine cutting gym class and hanging out at the mall. Back then, my father would deliver themed, Mike Brady--style lectures (one recurring favorite was the Importance of Being Honest), which I grudgingly tolerated and later dismissed. But as I've gotten older, a funny thing has come to pass: I've often found myself doing exactly what he told me to do, following even his most questionable advice -- like renting the movie "Pink Cadillac." 1. Hold hands while you hash it out. My folks have been married for 47 years. One of my father's rules for a happy marriage is that if a nasty argument erupts, hold hands as you fight. You'll feel goofy doing this, but here's the thing: It works. Recently my husband, Tom, forgot to pay a few bills that were buried under a pile of clutter. I was incandescent with rage. So we interlaced our fingers while we talked it out, and I felt my blood pressure plummet and my endorphins flow in spite of myself. It's impossible to scream at someone who is giving your hand a gentle squeeze. It just is. 2. Pay attention to anyone who wears a tool belt... My father is practical, thrifty (or, put more accurately, cheap), and savvy about home improvements. He calls a repairman only as a last resort -- and when he does, he hovers around the guy and asks tons of questions. " Carefully observe anyone with a skill that you don't have," my father often said, "and then you can take care of the fill-in-the-blank yourself." He was right: After shadowing a handyman for an hour, I later fixed my own dishwasher, to the perpetual amazement of friends who call their super to change a lightbulb. 3. ...Or a uniform. It has always annoyed my dad that a waiter gets a 20 percent tip for serving a crème brûlée, while a hotel maid who disposes of used dental floss often winds up with bubkes. My father routinely told our sanitation men and the crew who cleaned his office that they were doing a good job and made sure to compensate them at holidays. As a child, I used to writhe with embarrassment when he did this. Now I do the same for the sanitation workers in my neighborhood. One guy once told me, with a catch in his voice, that in 10 years, it was the first time he had ever been thanked. 4. You can never have enough baggies. Anything can be stored in a resealable plastic bag, according to my father. Shoelaces, maps, socks, meat. I used to mock his habit of bagging everything, but since then I've seen the light. They're miracle workers -- easy to stash, and you can spot their contents at a glance. Now, just like Dad, I have a special drawer just for these bags, which range from giant (for sweaters) to tiny (to squirrel away nuts in my purse). When I'm missing a size in my lineup, I get tense. 5. You can't go wrong with Clint. Dad says if you are at Blockbuster and are unable to decide what to rent, get a Clint Eastwood movie. Even the bad ones, he contends, are superior to most other films. Even "Every Which Way but Loose." Even "The Gauntlet" (look it up). Now, when I'm overwhelmed by racks of DVDs, I simply look for Clint's scowling face. 6. Don't belittle the annual sack race. When my sisters and I hit adolescence, my father doggedly upheld our many family traditions, despite a tsunami of scorn. "They don't mean anything to you kids now," he'd tell us, "but one day you'll invest in them yourselves." Have we ever. Every Fourth of July, we have a sack race, and I just introduced a new tradition last Christmas. After dinner, I passed out lottery tickets and coins. Soon, all you could hear was an industrious scritch-scratch. And my father was beaming. 7. 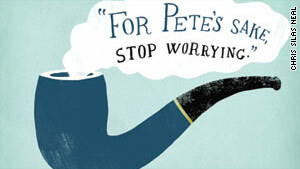 For Pete's sake, stop worrying. Dad, like many guys of his generation, is a doer, not a talker. Just "fix it," he tells himself, no matter how intractable the problem seems. His swift and decisive action used to strike me, a champion ditherer, as impulsive, but I've come to realize that consulting your gut leads to better decisions than exhaustive (and exhausting) deliberation. Now when I'm stymied, I say this phrase, and the answer comes. 8. Carry a hankie. Years ago, my parents and I were visiting a museum. I had a cold. My father handed me a fresh hankie and told me to keep it in my purse. And so I have. Tissues disintegrate, but not this sturdy cloth. Restroom dryer on the fritz? Handkerchief! Want to wrap a cookie to go? Handkerchief! 9. No one's smarter than you. Long ago, if I was in a group and the conversation strayed to an unfamiliar topic, I'd keep silent. Dad urged me to say, "I don't understand. Can you explain what you're talking about?" Asking questions makes you sound smart, he said, and confident to boot. At a recent gathering, somebody mentioned the Mauritius Continental Shelf. Silence. Then I asked, "What's that?" And all the former Ivy Leaguers around me exhaled and admitted they didn't know what the hell it was, either. 10. You will want kids. My father always encouraged me to have a baby. I used to tell him that it wasn't for everyone, but he shot back, "I know you, and you would love it." True enough: Tom and I became parents recently, and that little girl is the joy of my life. I cannot wait to impart my own pearls of wisdom to her, such as the infinite uses for twist ties or the Importance of Being Honest (sound familiar?). And since she's a lot like me, she'll probably roll her eyes and grumble -- and listen to every word.